I can't believe you are already a whole month old!! I feel like it was just last week when I heard Daddy say "It's a boy!" But, at the same time, I feel like we've known you forever. It's funny because you weren't even supposed to be born yet (your due date was this upcoming Thursday), but I'm so happy you were early! Clothes: You are such a little peanut! You actually wear size PREMIE, which is a size that Ella and Lucas never wore. The onesies literally look like doll clothes; so tiny! You are still swimming in newborn sized clothes, but they are starting to fit a little bit better. You wear size newborn diaper, and we just recently stopped folding down the top so they could fit better! Fun fact: I've never had to actually BUY newborn diapers until now; with the other 2 kids, by the time we used up the ones we stole from the hospital, they were into size 1s! Nicknames: Ben, Ben Ben, Benny, Benny Boo Boo, Peanut, Peanut Butter, B, Little/Littlest B, Bean, Little Bean, Buddy. Ella's nickname of choice is "Benny," while Lucas always calls you "Baby Bennett." Milestones: Ok, I SWEAR you rolled over last week in your crib! But I didn't get it on video, and I couldn't get you to do it again, so I can't count it. But you are crazy strong! 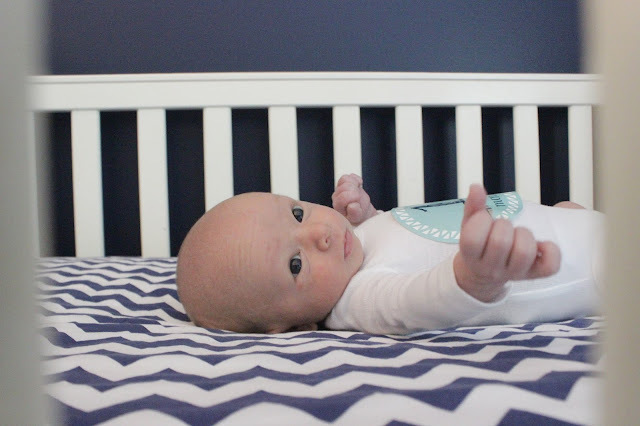 Your head control is actually pretty good, and you can lift your head up so high when you are doing tummy time! You are super close to social smiling, which I am so excited about! Because you were a premie, you had to hit a bunch of milestones before they released your from the NICU: maintaining your body temperature, breathing on your own, eating well, and sitting in your car seat without your oxygen levels and heart rate decreasing. So good job on those, buddy!! Sleep: Again, because of the whole premie thing, you are REALLY sleepy! You sleep a lot. You are probably only awake maybe 2-3 hours a day? I'm pretty sure you'd sleep all night if we let you; however, the doctor still wants me to wake you up to feed. So right now, you're sleeping from about 9 PM until midnight, and then midnight until 4 AM. Then we wake up for the day around 8 AM and you nap on and off throughout the morning and afternoon. Best Moment: Always, always, always...the day you came home from the hospital!! And honestly, the day you were born and finding out who exactly had been in there for the past 35 weeks was pretty amazing, too! Worst Moment: I don't really have one this month because you've been pretty great! I guess those 10 days you spent in the NICU weren't my favorite. And anytime you get super upset (which isn't often) I don't really like either. Likes: Sleeping, your paci, eating, the Mamaroo, being swaddled/snuggled with blankets, having the top of your head rubbed, riding in the car (but it MUST be moving), your hands, ceiling fans and lights. Also, you are not fazed by loud noises, which is good considering you live with Ella and Lucas! Dislikes: Baths, being cold, being hungry, diaper changes (you specifically hate getting wiped), being in a NON-moving car (Ella's preschool car line is definitely not your jam). Health: Obviously, we had a lot of ISO issues, with the hyperbilirubin and HDN, during your first 10 days of life (see HERE), but since then, you've been awesome! At last check, your hemoglobin was 12.7 and we will check it again next week! But other than all those stupid antibody issues, you are totally healthy! Eating: You are a GREAT eater probably 90% of the time. Occasionally, you will have a bad feeding, maybe once every other day. Sometimes, you are not interested in eating until the milk has gone away, and then all of a sudden you act hungry again! So we have done a few back-to-back feedings when you do that. But for the most part, you eat every 3 hours during the day, and every 4 hours at night. We did have a few issues with latching at the beginning (mostly because you were solidly bottle-fed while in the NICU), but thankfully after a day or two, you got the hang of nursing! You don’t spit up as much as your brother did, but when you do spit up, some of the milk comes out through your nose! It is the strangest thing! It doesn’t seem to bother you at all though! 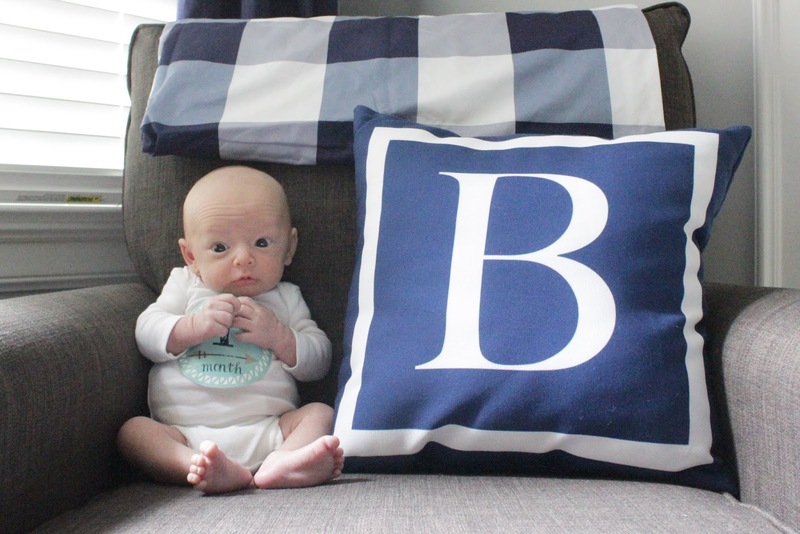 Bennett, you are such a wonderful addition to our family! You are such an easy and chill baby. That was the word all of the NICU nurses used to describe you: CHILL. Under all those lights, with monitors beeping, you would just lay there and hang out like you were on the beach! God certainly knew we needed you. We are all totally obsessed with you, so thank you for dealing with our smothering. You are the cutest little bean and we can't wait to watch you grow (just please don't grow up too quickly)! We love you so much Ben Ben! !